After a few hours in the cage, a few at the field, and a number of conversations with major vendors and the manufacturer, we take a swing at our 2018 Axe Elite Review. The bat is a two piece hybrid bat built with an endload. The unique knob and endcap lend to a memorable experience. Below we make a number of recommendations and offer our insights. We aren’t the only ones to have information about the L130F. Other places, in particular those who sell bats, usually have a boiler plate write up on the specs of a bat. Many of those we reference to make sure we are seeing what we should be. Here are some more references for the 2018 Axe L130F review. 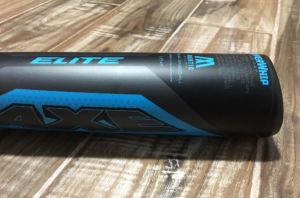 The Axe Elite is built with a very specific player in mind—a stronger, elite hitting type that likes the soft smash of a two piece composite. The Elite is not meant for a HUGE market of players. Most bigger hitters tend to prefer a single piece bat for the power they can generate. By definition, most players simply aren’t elite, therefore, prefer a big barrel and a lighter swing. Neither of those characteristics are to be found in the 2018 Axe Elite. The Axe Elite in a USA bat was likely the least talked about fantastic 2018 USA Bat on the market. Few knew about it, but those who did absolutely loved it. If you can find this guy for a sweet price don’t hesitate. The drop 5 is likely their most popular bat in this line. The bat absolutley rakes and has enough power behind it to do damange with any hitter that can weild it. expect a good feel through contact as well as a nice feel on the hands for the ergonomic handle. Compared to the 2017 Elite, there are no considerable changes. Both 2017 and 2018 Elites use a composite handle and a "Mantic" alloy in the barrel. They come in a USSSA drop 5 and 8 as well as a BBCOR drop 3. As well, the bat is still built with a heavier swing in mind. 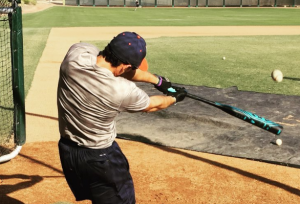 That is, expect it to work well for bigger and stronger hitters who like hot out of the wrapper bats. The major difference between the two years is the addition of a USABat in the lineup for 2018. That two piece bat is a drop 5. Obviously, there is nothing in the market with an asymmetric end cap and knob that uses a hybrid design. Such things are reserved only for the Axe line of bats. But, in terms of an endloaded two piece hybrid bat, you have a few options. The first that comes to mind is the DeMarini Voodoo. It comes in both an endloaded (Insane) and balanced version. The Voodoo is a well mannered, known commodity in the hybrid sapce and has been in the market for years. This stands as the most known two piece hybrid bat, and if you are in the market for a hybrid, it is worth a look. Our dissection of the Axe handle on this site has been exhaustive. We refer you to those for more lengthy discussions.In short, the Axe handle’s ergonomic shape allows for better bat control. And better bat control allows for a number of positive results—all of which result in more success at the plate. The other remarkable feature of the 2018 Elite is the asymmetric end cap. The oval shaped knob forces contact on only one side of the barrel. This ability to predict where impact occurs gives Axe engineers some liberty in shaving volume and weight off the backside of the barrel. This design, which they call the Hyperwhip, is found on all of their performance bats for 2018. As such, you’ll find the hyperwhip feature on every Axe Elite bat for 2018. Lost in all the hoopla of the asymmetric end cap and knob is the fact the Elite is a two piece hybrid bat, too. It is a traditional two piece hybrid with a composite end cap and aluminum barrel. These features lend to a smooth smash and a hot out of the wrapper performance. The 2018 Axe Elite comes in three general sizes and a number of lengths within that size. The three sizes are a drop 3 BBCOR, drop 5 and 8 USSSA 2 5/8 and a drop 5 2 5/8 USABat.